I flew from Newark to LAX for $49.95 (leaving at midnight; leaving at 2:00 AM, it would have been $29.95). Cabfare from the airport to Canoga Park was $96.00. Regular daytime one way fare was $79.95. People Express' terminal at Newark Airport was jokingly referred to as the Greyhound station of the air. And it looked the part. 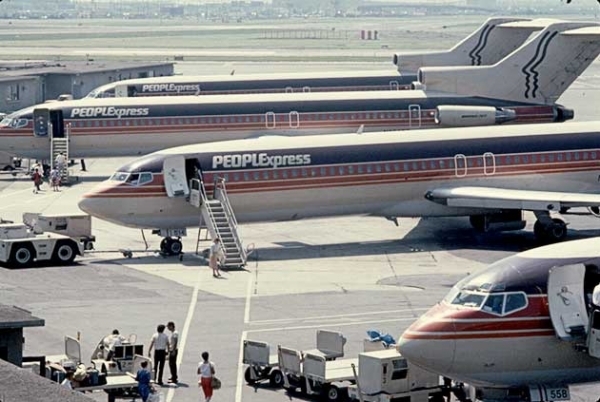 I remember taking this airline from the West Palm Beach Airport to Newark Airport in the mid 80s (Hadda drive from Ft lauderdale to West Palm Beach - PE's only airport in South Florida)...my buddy, Jerry, would pick me up - we stay at his place for a few days...or I'd visit my late brother, Tim, I'd rent a car and drive to either of his places in Haledon or in Butler, NJ....Cheap. no frills whatsoever...you carried your own luggage and boarded up the old fashioned rollup steps, picked your own seat and paid on board in cash...nice thing for me was that I could get a flight on ther 'spur of the moment' My bud called one Wednesday night.."Wha'cha doin' this weekend??? Feel like flying up and helping me drive mmy dad's Chrysler Codoba down to Florida...I'll pay for your flight up???" So I did - flew up Friday night, we left on Saturday AM and after driving all night at speeds far in excess of those posted, we got back to Ft Lauderdale late Sunday Afternoon, with a quick detour to pick up my car At the WPB Airport....that section of the Palm Beach International Airpoert no longer erxists...it was renovated in the late 80s...no more climbimng up roll away stairs to your $85 one way trip to the NYC area...good memories old pre TSA bullsh*t and groping.